Nesuto: Celebrates Christmas with New Enchanted High Tea Set, Exquisite Log Cakes & Festive Cookies! Yay! Nesuto is back with yet another AMAZING Christmas Enchanted High Tea Set bound to tantalise your taste buds. If you have been following my blog closely, I’m a HUGE fan of their entremets and I’ve always been recommending my loved ones to check out this place for High Tea! 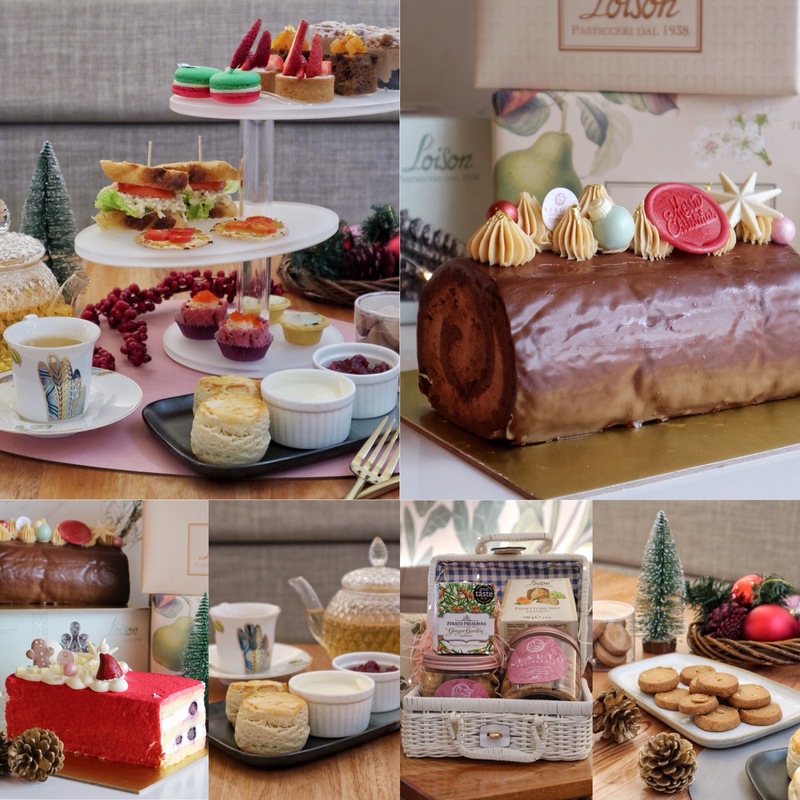 Besides the new High Tea Set, Nesuto has also rolled out two exquisite Christmas log cakes – The Noél Decadence and Oh Santa!, as well as a range of festive cookies. To make Christmas even more exciting this year, you can also purchase Christmas Hampers as a gift for your loved ones or even corporate clients. Here’s a photo compilation of the Christmas offerings from Nesuto this year! They look absolutely gorgeous right? of sweets and savouries, and comes with a pot of refillable tea of the customers’ choice. For the choice of tea, I would highly recommend the Lychee flavoured one (I’ll order this whenever I’m dining at Nesuto)! To keep that element of surprise (for you), I shall not reveal too much but will just show you some pictures of the Enchanted High Tea Set! Try it yourself to know how awesome this is! And of course, each High Tea Set comes with their signature and popular scones! Never fail to amaze me every time even though I had it for so many times. Pair it with their Mascarpone & Homemade Berry Compote for maximum pleasure ? *Available daily from 12.00pm – 5.00pm, reservations must be made at least one day in advance. A dark, fluffy and delicious chocolate roulade, filled generously with chunks of Crunch Pailleté and dark, decadent Valrhona Guanaja Crème Monteé. Coated with dark luscious, rich Valrhona Ariaga Noire Ganache, it is the perfect log cake for all chocolate lovers. If you prefer a fruitier log cake, fret not as we have just the right one for you. Let the refreshing summer flavours of Oh Santa! fill you up this Christmas! Imagine, fluffy and soft vanilla souffle sponge, rolled up with blueberry compote and luscious lemon mascarpone cream. Coated with Valrhona Ivoire white chocolate cream, this cake is guaranteed to keep you coming back for second servings! *The mouth-watering showcase prepared by Pastry Chef Alicia Wong is now available for pre-order through Nesuto Patisserie’s Christmas catalogue – visit https://www.dear-nesuto.com and oddle page! Alternatively, customers can call/walk in to Nesuto Patisserie to place their orders. Also, I got to sample Nesuto’s new Christmas cookies and they were fragrant and crunchy. My friend finished it in no time! Attractively priced, you can also purchase Three Christmas hampers from Nesuto– The Indulgence (only sweet treats), The Delish Delight (includes pork sausages, honey glazed ham, smoked salmon, cheese and wine) and The Supreme (similar to The Delish Delight, with an addition of our signature Nesuto French brandy fruit cake), are catered for different serving sizes. Pre-order your hampers today form our website or oddle page today! Previous PostSpatula: Popular Halal Bakery Now Opens A Cafe with Homely Menu such as Smoothies Bowl, Grilled Cheese Croissantwich and Churros Waffle! Next Post(NEW) Walking On Sunshine: Garden-Themed Beauty & Dining Concept Hits Orchard Central with Breakfast Buffet at ONLY $15?! !